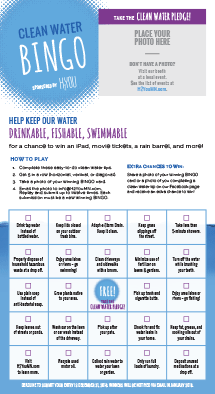 Take the pledge and download our Clean Water BINGO. Play to help keep our water clean and you could win some great prizes — an iPad, a rain barrel, movies tickets and more! Central Minnesota Water Education Alliance (CMWEA) is a coalition of Central Minnesota cities, counties, and other organizations that provides educational outreach to promote water quality stewardship. Copyright © Central Minnesota Water Education Alliance (CMWEA). All rights reserved.